Rocky and Bullwinkle are 50 today. 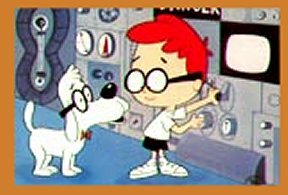 Yes, it was Nov. 19, 1959, that “Rocky and His Friends” debuted on ABC. It’s one of my faves from way back. Here are some nice birthday tributes from the newspapers in Milwaukee, Dallas and Santa Rosa, Calif., along with Creative Loafing, an indie weekly. If you somehow need a further reminder of the greatness of Moose and Sqvirrel, go watch over at Hulu. … and share the story behind a tune shared here a couple of years ago. “Hey Rocky!” is a little bit of house music that came out of Chicago in 1986. All kinds of samples from the old Rocky and Bullwinkle cartoons are laid over dance beats. “The making of the record was supported (in addition to my fondness for the Moose and Squirrel) by a guy named Larry Sherman, who started Trax Records. He had a major dislike for his main competitor in Chicago, Rocky Jones, who ran arch-rival record label DJ International. Thus the ‘Hey Rocky, hey Rocky/Watch me pull a rabbit out of my hat.’ All good fun. “The record actually did really well! It started off on radio station B96 here in Chicago, and then Dr. Demento added it into rotation on his nationally syndicated show, and other stations picked it up across the country. At the time, I got a bunch of calls to do interviews for radio stations from San Francisco to New York, and many points in between (like Oklahoma, Virginia, Florida). It was kind of wild, since I made the record as sort of a joke. Ah, the power of Moose and Sqvirrel. Enjoy it again. 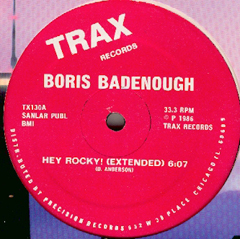 “Hey Rocky!” Boris Badenough (Dean Anderson), 1986, the A side of the Trax Records 12-inch single TX130. The B side is the instrumental version. It’s out of print. Anderson gets the writing credit; Frankie Knuckles gets the mixing credit. This is all kinds of awesome. A tip of the Kurward Derby to you, sir. Awesome, indeed. They are cheering in Frostbite Falls. This is funny. I was just playing it for Miles, who LOVES Bullwinkle & Rocky!